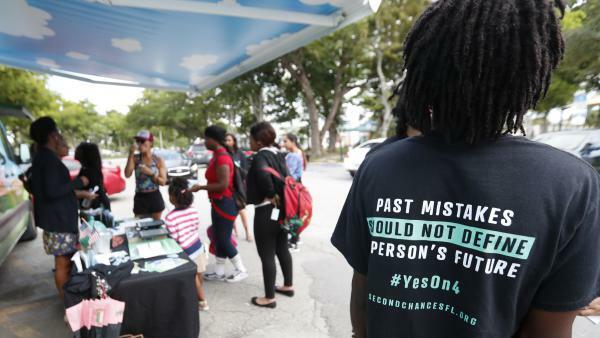 People gathered around the Ben & Jerry's "Yes on 4" truck in Miami as they learned about Amendment 4 and ate free ice cream. Floridians voted in November to automatically restore voting rights to most felons after they complete their sentences and probation. Before the constitutional amendment, the question of whether to restore felons' voting rights was entirely up to the state's Executive Clemency board, made up of the governor and some of his Cabinet members. And it's been a controversial political issue in Florida for many years, reports the Palm Beach Post. When then-Republican Charlie Crist became governor in 2007, he made it easier for felons to restore their voting rights, even automatically restoring rights to those convicted of nonviolent crimes after they had served their sentences. But in 2011, soon after Gov. Rick Scott was elected, he made it much more difficult for felons to restore their voting rights. Ex-felons needed to wait at least five years after their sentences were complete to even apply to have their rights restored, the Palm Beach Post reported. Even then, they faced a time-intensive process with no guarantees. Sometimes it would take years to be seen. The board has a backlog of more than 10,000 applications and meets only four times a year, restoring an average of only 400 felons' voting rights a year, the Miami Herald reported. Once felons were seen by the Executive Clemency board, members could ask questions about matters far beyond the original felony conviction, such as how much the applicant drinks and whether they go to church, NPR has reported. And according to an investigation by the Palm Beach Post, the process led to racial disparities. "Scott restored the voting rights of twice as many whites as blacks and three times as many white men as black men," the Post reported. A federal judge last year found Florida's procedure for restoring voting rights gave far too much discretion to state officials, and violated the First and 14th Amendments to the U.S. Constitution. "Disenfranchised citizens must kowtow before a panel of high-level government officials over which Florida's Governor has absolute veto authority," Judge Mark Walker wrote in a blistering opinion. "Partisan officials have extraordinary authority to grant or withhold the right to vote from hundreds of thousands of people without any constraints, guidelines, or standards." "A person convicted of a crime may have long ago exited the prison cell and completed probation," Walker wrote. "Her voting rights, however, remain locked in a dark crypt. Only the state has the key — but the state has swallowed it. Only when the state has digested and passed that key in the unforeseeable future — maybe in five years, maybe in 50 — along with the possibility of some virus-laden stew of viewpoint discrimination and partisan, religious, or racial bias, does the state in an 'act of mercy,' unlock the former felon's voting rights from its hiding place." "A state may disenfranchise convicted felons," Walker wrote. "A particularly punitive state might even disenfranchise convicted felons permanently. But once a state provides for restoration, its process cannot offend the Constitution."